Popantel Tapewormer Tablets is specially formulated tapeworm treatment for Dogs and Cats. It controls tapeworm infection and protects animals against the harmful effects. It treats and prevents various types of tapeworms including Dipylidium caninum (common flea tapeworm), Taenia taeniaeformis, Taenia ovis, Taenia hydatigena, Spirometra erinacei (zipper worm) & Echinococcus granulosus (hydatid Tapeworm). The oral treatment is also efficient in treating hydatid tapeworm in dogs. Safe for pregnant dogs and cats, Popantel Tapewormer is highly palatable and easy to administer. 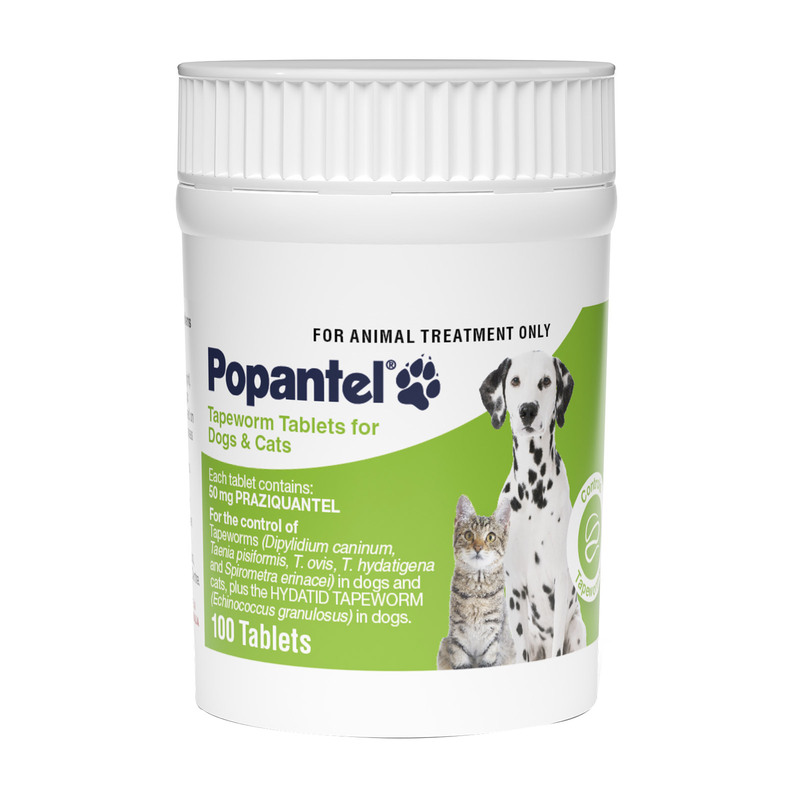 Popantel Tapewormer is an effective tapeworm treatment for dogs and cats. It contains the active ingredient – Praziquantel. The component is the most effective parasiticide used against tapeworms. The anthelmintic is most widely used in eliminating tapeworms and treating tapeworm infection in dogs and cats. It acts the worms within the few hours of administration. It does not have any residual effect. Thus, it is safe for dogs and cats. 1 tablet per 10kg is the standard dose. For treating zipper worm, the dose rate should be increased to 1 tablet per 2.5 kg. For Hydatid tapeworm control in dogs, treat every 6 weeks. For other tapeworms, treat every 3 months or as per vet’s advice. For pregnant animals, treat prior to mating, 10 days before and 4 weeks after birth and then every 3 month. No possible contraindications seen of using this product. It is the most effective tapeworm remover of all. I use this tapewormer regularly and I am getting the desired results. The stool is clear and healthy.